Designers never are short of ideas but when they get a creative block they usually find an inspiring work of art to give them the stir and spur to compose something out of the blue, they confront challenging tasks, horrific clients and tremendous heat wave of their projects at work. The entire enterprise/firm depends on them because they are pivotal in making the company’s logo design, brochures, posters, flyers, business card and things that cover the entire office. Every now and then they have to look up to the works of artists to get the inspiration out of it. From education sector to business tasks, from dealing with medicine to the entertainment world, they cover all and sundry & make the best out of everything. Most of the designers are so devoted to their day to day job that they even don’t pay a look at their own selves; this is professionalism and the level of expertise that the designers own. They keep the tolerance level intact & do not get offended when being asked to redo and remake the design. Their duty is to satisfy the clients so they pay a check in again and again. Build a good stance and a positive impression on to your clients so in the corporate world your esteem and repute goes on the 7th sky. 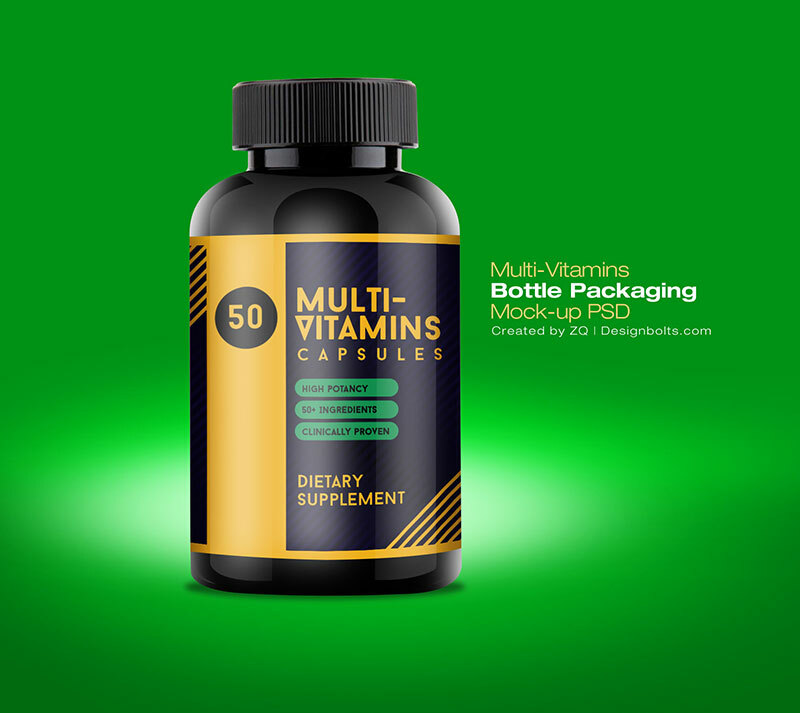 Have a look at this free multi-vitamin bottle packaging mockup PSD that I made to provide you a little help in making your presentation for your client, he will for sure approve of your design after seeing the stunning mockup of vitamin bottle. This bottle mockup is plain with bigger font and has an impactful feel conveying the gist of it. You can change the look of it the way you want it to be, for more freebies keep leaving us with your feedback & let us know how far these mockups and design dose is helping you in your pursuits of designs. thank you a million times, my friend!